KCM’s primary schools programme offers a wide range of hands-on, educational activities based on the primary curriculum. Guided tours, interactive workshops and discovery trails enable pupils to explore our exhibitions in a fun and accessible way. With four different visitor experiences to choose from there is something to suit every class. Please note that advance booking is essential for all tours. Travel back in time and visit a medieval town complete with the sounds and smells! 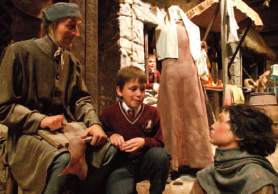 Our medieval experience is a reconstruction of the bustling market town of Tralee in the year 1450. Equipped with fun activity sheets pupils enter through the town gate and stroll down ‘Burgess Street’, Tralee’s main medieval thoroughfare. See how the butcher, shoemaker and merchant went about their business; discover how criminals were punished and find out why rubbish was thrown out of the windows into open sewers. tailor a visit to suit your learning goals. Bone Investigators is the latest interactive attraction in our Museum. Children get to dig up two Viking skeletons, a man and a woman, along with exciting replica grave goods. 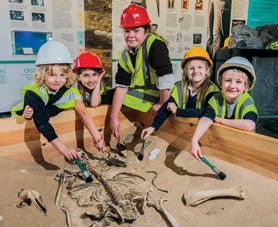 In this handson dig workshop pupils dress up in high-vis vests and, equipped with kneeling pads and brushes, discover why and how archaeologists excavate and what we can learn from their finds. The dig experience is based on the excavation of a spectacular Viking burial site at Cloghermore Cave, near Tralee. From Stone Age hunters to Polar explorer Tom Crean – delve into 7,000 years of Kerry’s fascinating past. Pangur Bán, a clever white cat who lived in medieval times, is our guiding spirit and his exciting trail will lead pupils through the Museum Gallery and Tom Crean Room. 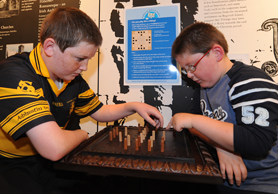 Fun activity sheets and plenty of interactive displays allow pupils to discover fascinating artefacts along the way. 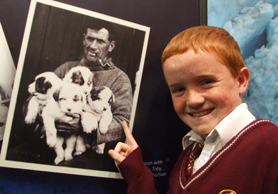 Discover the story of Antarctic explorer Tom Crean. Kerry hero Tom Crean went on three expeditions to reach the South Pole with Scott and Shakleton – altogether he spent 10 years of his life in one of the coldest and most dangerous places on Earth. In our award-winning exhibition, pupils find out about the man behind the legend and can even dress up as Tom Crean.